Pakistan’s constitution mandates national census to be held every 10 years. Despite that, the census was conducted in 2017 after a long delay since the last held exercise in 1998. This delay also pushed the census close to the upcoming General Elections in 2018. According to the Delimitation of Constituencies Act, 1974, the constituencies for elections to the National and Provincial Assemblies are to be delimited after every census. The General Elections are then to be carried out on the basis of fresh delimitations. The time period required by Pakistan Bureau of Statistics to publish the final census results would have made in unachievable for the Election Commission Pakistan (ECP) – to conduct timely delimitations prior to the elections. Therefore, in December 2017, the 24th constitutional amendment enabled the ECP to conduct delimitations on the basis of provisional population census. Post Census developments have been largely contentious. Various Political parties have been challenging census results, and now the delimitations of constituencies. On March 5, ECP published the first draft of delimitations on basis of provisional Census results. The document was circulated for public objections. Reportedly, by 3rd April ECP received 1,286 objections. Of those, 689 objections came from Punjab, 284 from Sindh, 181 from K-P, 104 from Balochistan, 17 from Fata and 11 from ICT. The ECP began their hearings from 4th April onwards. The petitioners unsatisfied by the ECP decisions were allowed to approach the Supreme Court. On 4th may-after a series of hearings into the objections against fresh delimitations the ECP notified the new delimitations of national and provincial assemblies’ constituencies. However, several petitioners continue to approach the courts. In order to reduce the variation in constituency sizes and ensure equality of vote, The Election Act 2017 stipulates that the variation in constituency sizes should not exceed a maximum of maximum of 10%. A report by The Democracy reporting International notes that, neither the Act nor the Rules elaborate on how we should assess if a constituency exceeds this threshold. The report elaborates that in delimiting the constituencies, the ECP has calculated a population quota per seat based on the number of seats allocated to each province in the constitution. For example, as per the provisional census, Khyber-Pakhtunkhwa has a population of 30,523,371 and it has been allocated 39 seats in the National Assembly. Based on this, the average population of a constituency – or the per seat quota – for the province is 782,651. This quota is then used to calculate the number of seats for each district. 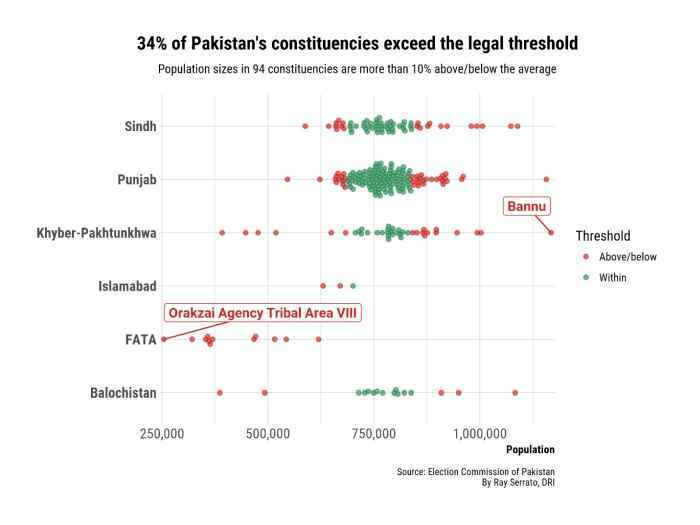 This way of first determining the number of seats per province appears to reflect the constitutional provisions (although it does not help to ensure the idea of an equal vote across Pakistan, as it should not matter in which province a citizen lives). It was also identified that 94 constituencies, or 34%, have population sizes that are larger or smaller than the 10% threshold set in the Election Act. Islamabad High Court set aside delimitation in a number of constituencies and referred the cases back to the ECP for fresh demarcation. The delimitation of districts Ghotki, Kasur, Sheikhupura, and Kharan were declared null and void. The delimitation of Haripur and Bahawalpur constituencies was also declared void. The court ordered the ECP to hear all stakeholders and carry out the delimitations process again. The IHC heard petitions regarding delimitation of constituencies, in Attock and Abbottabad. The bench reserved its order in the petition challenging delimitation of district Abbottabad. The IHC declared delimitation of Jhang, Jhelum, Toba Tek Singh, and Lower Dir void. The IHC has also dismissed some of the petitions against the delimitation- such as pleas against the delimitation of Khanewal, Chiniot, Kurram Agency, Rajanpur, Mansehra, Swabi, Jaccobabad, Gujranwala and Umerkot. Petitions against Sialkot, Bannu, and Rahim Yar Khan Constituencies were also dismissed. Reportedly, the high court is hearing 108 petitions lodged against delimitation from PPP, PML-N and PTI. The Balochistan High Court nullified delimitations in Quetta district and ordered the Election Commission to re-conduct the exercise. The Balochistan High Court ordered ECP to carry out fresh limitations of the provincial constituencies PB-24, 25, 26, 27, 28, 29, 30 and 32. Petitions were filed by many workers of PkMAP. Despite the Balochistan High Court order- the ECP has decided to retain delimitations for the constituencies and is facing backlash of parties such as PkMAP. The Lahore High Court Rawalpindi Bench nullified the new delimitation of Provincial Assembly Constituency (PP-4) Pindigheb. 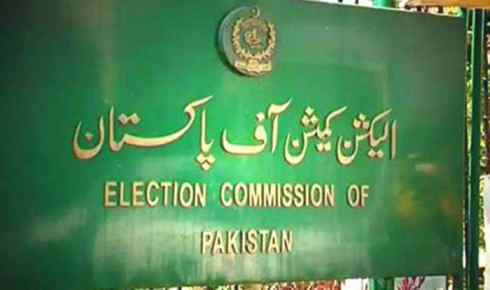 The apex court ordered the ECP to carry out the exercise afresh. The Peshawar high court’s Mingora bench has declared delimitation of all Swat constituencies null and void and directed the ECP to review the demarcations. Despite the independence granted to ECP, some voices call for an enhanced inclusion of parliamentarians coupled with public scrutiny to ensure fair practice by ECP in the delimitation process. One view assumes that the ECP’s efforts are being hindered by continuous litigations against the delimitation results as efforts to postpone the elections. Whereas, key opposition concerns fear that ECP along with other administrative structures of the state may contain elements that could influence the outcome of the upcoming elections- therefore they are also asking for more clarity on the delimitation procedures. Key national figures have already stated that elections would be held on time. However, the close proximity of the census exercise with the General Elections 2018 put significant time constraints on the lengthy pre- Election procedures- which has culminated into a confusing environment.